Jan Ozer has posted his presentations from this week's Streaming Media East conference. As in previous years, Ozer continues to kindly share his extensive experience and research, providing great updates on the state of video streaming technology, and especially on video codecs. - Since live video streaming is such a solved problem (sorta), it's time to look at distributing live video via multiple outlets. In Technologies for Live Streaming to Multiple Platforms, Ozer covers options, trade-offs, and pricing for approaches including hardware devices, software, live streaming platforms, distribution platforms, web conferencing, and production platforms -- plus Facebook Live. - The uncertainty around new codecs to step up from H.264 continues, with the new HEVC codec providing substantially better performance than baseline H.264. In Comparing and Choosing The Best HEVC Codec, Ozer provides extensive evaluations of competing HEVC codecs, and also reports similar performance for VP9 and sees promise in the new AV1 developments. - For more on understanding encoding and the glorious future of HEVC, VP9, and MPEG-DASH see Ozer's exhaustive (159 page) presentation on Codecs & Packaging for PCs, Mobile & OTT/STB/Smart TVs. 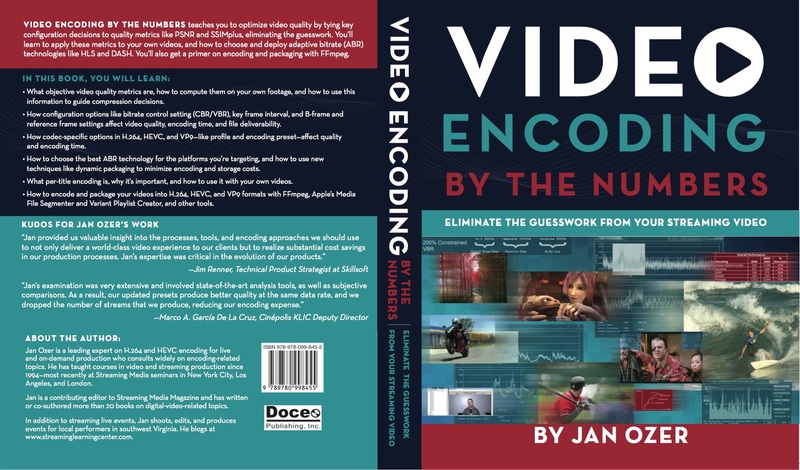 Finally, I should reinterate my plug for Ozer's recent book, Video Encoding by the Numbers: Eliminate the Guesswork from Your Streaming Video (see earlier post). This is a wonderful resource for anyone doing video compression, covering the basics of encoding, details of the latest technologies, and the application of objective quality metrics to analyze the video and report its visual quality. Entries posted to Manifest Tech Blog in May 2017, listed from oldest to newest.